This 189,433-square-foot building, designed by Pei Cobb Freed & Associates, was delivered in 1996 and is renowned for the innovative uses of light, energy, and heating and cooling - benchmarks for green architecture and energy efficiency. This stunning granite building includes state-of-the-art lighting, mechanical, and elevator systems as well as flexible classrooms and a 170-seat auditorium. 1200 New York Avenue is a flagship for environmentally friendly design and management. Akridge developed the building for the American Association for the Advancement of Science (AAAS) and its science-related building Clients. 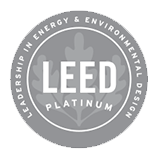 1200 New York Avenue is LEED Gold Certified and an EPA ENERGY STAR labeled property. To submit a service request, Clients may use our online service request system, www.Akridge.com/service, fax requests to 202.347.8043, or simply call us at 202.638.3000 to receive a prompt and courteous response to all your building needs. 1200 New York Avenue is electronically monitored by Datawatch. For more information on DataWatch, visit www.datawatchsystems.com, or call 301.654.3282. 1200 New York Avenue has a number of Client amenities, including bicycle racks in the parking garage and a lobby attendant. 1200 New York Avenue is an EPA ENERGY STAR labeled property. Investment partners click here to find up to date information on the asset and other market information.